In the half-century between his earliest recordings in the 1950s and his death in 2004, Ray Charles ascended to icon status by leaving his mark on virtually every form of American popular music that emerged in the latter half of the 20th century. Nowhere was this more evident than in his live performances, where one was likely to hear shades of blues, soul, R&B, jazz, gospel, country, and more in a single evening – indeed, sometimes in a single song. To put it simply, the Right Reverend did it all. All of these subtle shades and styles are evident in Concord Music Group’s reissue of Ray Charles Live in Concert. Originally released as a 12-song LP on ABC-Paramount in early 1965, Live in Concert captured Ray at the Shrine Auditorium in Los Angeles in September 1964. 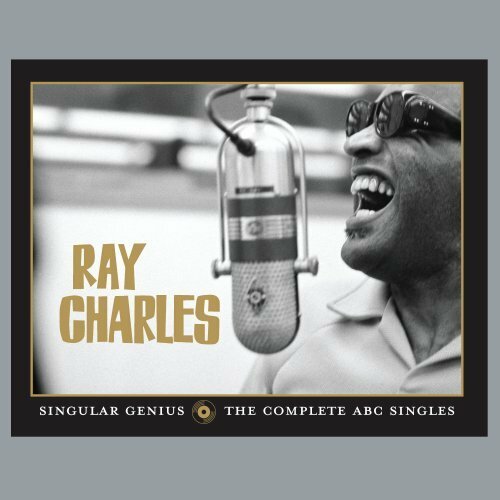 More than four decades later, the CD reissue brings additional depth and perspective to the 1964 recording with the help of 24-bit remastering, seven previously unreleased tracks and extensive new liner notes that provide additional historical context to what is already considered a pivotal recording in Ray’s overall body of work. In the span of 19 songs, Live in Concert illuminates the route to that destination. Ray wastes no time taking his audience on a ride from jazzy big band groove of “Swing a Little Taste” to the Latin-flavored “One Mint Julep” to the blues-gospel hybrid of his classic “I Got a Woman.” Although his live rendition of “Georgia On My Mind” on this date didn’t make the cut on the original LP, the song is a standout track on the reissue, thanks to his complex organ runs and the flute lines moving in counterpoint with his rich vocals. Further in, the rousing “Hallelujah, I Love Her So” is driven by a gospel groove and embellished with a sax solo by Newman that closely mirrors the original 1957 recording. The result is a familiar hit for an audience that’s more than ready to reinforce Ray’s foot-stomping beat with handclaps. The sly and swaggering “Makin’ Whoopee” is delivered completely off the cuff, with drummer Wilbert Hogan, bassist Edgar Willis, and guitarist Sonny Forriest improvising an accompaniment behind what Dahl calls “Ray’s luxurious piano and breathy, supremely knowing vocals.” By all accounts, Ray spontaneously inserted the song into the set in response to the negative press he’d received overseas about his private life. In the home stretch, Ray introduces the Raeletts, the female backing vocalists who served as his foil for some of his biggest hits. Together they work their way through “Don’t Set Me Free” (with Lillian Fort stepping forward for a duet with Ray), the comical “Two Ton Tessie” and the torchy “My Baby” before climaxing with the churning “What’d I Say,” a song tailor-made to stoke any room to a fever pitch. A huge piece of the Ray Charles legacy is his mastery of any style he touched, and his ability to make it his own in a way that no other artist could – powers that can only come from an innate sense of adventure and spontaneity that are fully evident in Ray Charles Live in Concert. Here’s another fine re-release by the folks at Concord Music Group. This collection is a bit of a musical road map as Brother Ray travels from state to state and burgh to burgh — musically, that is. The CD is pretty strong throughout, although I must confess I strongly prefer The Raeletts to the Anita Kerr Singers when it comes to the backing vocal choruses. That’s pretty much a no brainer if you’re under the age of 85. There are a couple of flat tires along the way – most notably Deep in the Heart of Texas and Blue Hawaii. Ray often had the ability to elevate cheesy material with his magical interpretive prowess, yet these 2 cuts are really hard to sit through. The latter is just too closely identified with Elvis, while Texas is a toss away novelty romp and that should have been tossed away … period. The bonus tracks are OK and include a swinging version of Bill Monroe’s Blue Moon of Kentucky. The Beatles’ The Long and Winding Road is awkward at best and John Denver’s Take Me Home Country Roads is an obvious mistep. All in all the hits outweigh the misses, making this a pretty enjoyable road trip with one of the great vocal stylists of our time – or any time for that matter. Buckle up and hit the gas pedal! When Ray Charles left Atlantic Records for ABC-Paramount, his first move was to gather up a dozen vintage songs about U.S. destinations. The resulting album, The Genius Hits the Road, in turn gave Charles his first No. 1 hit, a soulful reading of Hoagy Carmichael’s “Georgia On My Mind.” The album, which also contains such travel songs as “Alabamy Bound,” “California, Here I Come,” “Deep in the Heart of Texas” and “Blue Hawaii,” marked the start of Charles’ long association with producer Sid Feller and featured band longtime accompanists saxmen David “Fathead” Newman and Hank Crawford, plus the Raeletts. A deluxe reissue of The Genius Hits the Road, augmented by six bonus tracks, digital re-mastering and new liner notes by Bill Dahl alongside original notes by Rick Ward. The Genius Hits the Road was recorded in two lengthy New York recording sessions in March 1960. “Georgia On My Mind” was first on the evening’s agenda. The song’s lyricist Stuart Gorrell actually found his inspiration in Carmichael’s sister Georgia rather than the state, but the words pay tribute to either. It was Charles’ first No. 1 hit, earning him two of four Grammys that year. The album also contained a version of Leo Robin and Ralph Rainger’s “Blue Hawaii,” recorded originally for the 1937 movie Waikiki Wedding starring Bing Crosby. A year after Charles recorded it, the song became the title track to a 1961 Elvis Presley film. The Genius Hits the Road vaulted to No. 9 on Billboard’s pop charts during a 50-week run that began in October 1960. But this particular road was just the beginning of a new journey for Brother Ray. Please do yourself a favor and pick this one up. The reissue includes both Vol. 1 and Vol. 2 on one CD. It includes some of my favorite Charles interpretations including his goosed up take of The Everly Brothers “Bye Bye Love” and Don Gibson’s timeless “I Can’t Stop Loving You.” I also love the slow, slinky version of “You Are My Sunshine.” Ray and the girls take that tune to church and the results are indeed soul stirring. Although it may have shocked some people at the time, Ray Charles’s fascination with country and western music was anything but an overnight development. Thus, his 1962 album Modern Sounds in Country and Western Music and its encore Modern Sounds in Country and Western Music Volume 2 represented the culmination of a lifelong love affair rather than a producer’s convenient way to expand Brother Ray’s LP catalog. “That was strictly his idea, something that he wanted to do,” confirmed his chief tenor saxophone soloist, the late David “Fathead” Newman. Since joining ABC’s roster in late 1959 after permanently altering the rhythm and blues landscape at Atlantic by mixing blues and gospel into a groundbreaking recipe that sired soul, those projects had included albums devoted to songs about destinations (Genius Hits the Road) and names of women (Dedicated to You). Charles had been contemplating an LP of country chestnuts for years, so to him it wasn’t a radical concept. What was earth shattering was the way Ray redefined each song. His sanctified voice would never be mistaken for that of Ernest Tubb or Webb Pierce, and there was a huge difference between traditional country fiddles and the cosmopolitan strings gracing these two albums. When Ray unleashed the roaring horn section from his recently formed big band, those country evergreens swung like never before. Having made countless new country converts by giving these 24 songs a soul-steeped urban dimension, Charles would continue to dip into the C&W songbook. He covered Johnny Cash’s hit “Busted” to Grammy-winning acclaim in 1963, and his remakes of Buck Owens’s “Crying Time” and “Together Again” hit during the mid-’60s. Then again, Ray’s unique vocal interpretations inevitably made any song from any genre entirely his own. “He created more things with his voice than any other singer I ever knew in my life, or ever heard of,” said Feller. “To me, creating itself is the genius part.” That genius permeates these two volumes of Modern Sounds in Country and Western Music. Interesting poll results — can’t argue with Aretha leading the charge. Ray Charles and Elvis Presley round out a solid Top 3. Some will argue about Dylan cracking the Top 10. Others may scratch their heads a bit at Lennon (a shouter) eclipsing McCartney (a crooner). Well, maybe I just answered that one for you. Let’s just say both were great in their own way and neither would have made it as big without the other’s competition. A review of their solo works (Paul gets the nod in my book) confirms that statement. I can’t wait to see the complete list. She’s already the Queen of Soul, but now Aretha Franklin has been named the greatest singer of the rock era in a poll conducted by Rolling Stone magazine. Franklin, 66, came in ahead of Ray Charles at No. 2, Elvis Presley at No. 3, Sam Cooke at No. 4 and John Lennon at No. 5, according to the magazine’s survey of 179 musicians, producers, Rolling Stone editors, and other music-industry insiders. The 100-strong list will be published on Friday, when Rolling Stone hits the newsstands with four different covers. Besides Franklin, the only other living people in the top 10 were Bob Dylan at No. 7 and Stevie Wonder at No. 9. Marvin Gaye was No. 6, Otis Redding No. 8, and James Brown No. 10. Other notables included Paul McCartney at No. 11, one place ahead of his idol, Little Richard; and Mick Jagger at No. 16, also one ahead of a key influence, Tina Turner. Among the top 25, 50-year-old Michael Jackson was the youngest, coming in at No. 25. Voters included Metallica frontman James Hetfield, folk singers David Crosby and Yusuf Islam, Rolling Stones guitarist Keith Richards, punk rock veteran Iggy Pop and English pop star James Blunt. They each submitted their top 20 choices, and an accounting firm tabulated the results.